Growing up, I loved the Christmas season. I loved listening to Christmas music, watching Christmas movies, eating way too many Christmas cookies, and having a few weeks off of school. The best part, though, was opening gifts on Christmas morning with my family. My younger brother and I had a pact. Whoever got up first would go and wake up the other one. As a kid, sleep doesn’t seem important when there are presents to unwrap. In the early morning hours, my brother and I would head downstairs, look at all the gifts under the tree, go through our stockings, and anxiously wait for our parents to wake up. Christmas has always been my favorite holiday, but one year I found it extremely hard to celebrate. When I was 26 years old, my mom passed away after a 9-year battle with breast cancer. It was difficult watching my mom endure so much suffering over the years, and when she finally went home to be with Jesus, I felt as if she took a piece of me with her. My heart and my world felt completely shattered. The first year after a loss is extremely tough. The holidays are supposed to be a time of joy and celebration, but it’s hard to celebrate when you’re missing a loved one. It was hard taking our annual family picture by the Christmas tree without her. It was hard eating Christmas dinner and seeing the empty chair where she always sat. It was hard opening gifts, when the one thing I wanted the most couldn’t be bought at a store. That Christmas, my Dad told my brother and I that we each had a special gift, but it had to be opened last. I was already holding back tears, and then my mind started racing, wondering what this special gift could be. It was finally time for us to open our last gifts. We each had identical looking bags to open. We opened them at the same time, and as soon as I saw what was inside I couldn’t hold back my tears any longer. In that instant, even though my mom wasn’t physically there, the room was filled with love and precious memories of her. 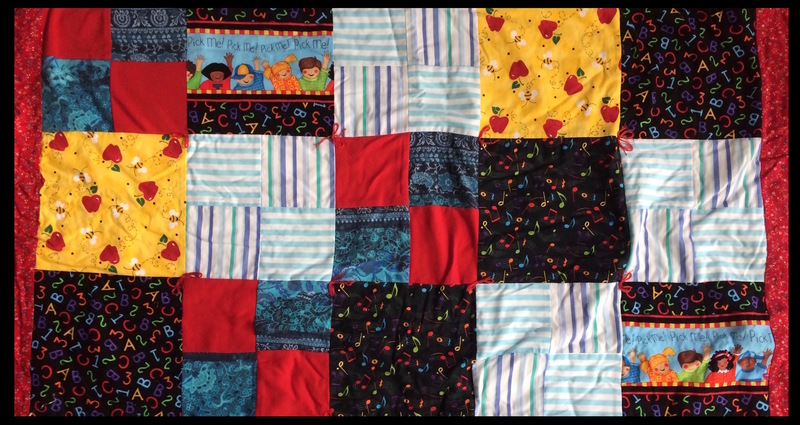 We each received a quilt made from some of our mom’s clothes. My Dad explained that the quilts were made by our mom’s childhood friend (who also happened to be one of her co-workers). It was a gift that I never expected, but will always treasure. It was made out of love and reminds me of a person who I will always love. Whenever I look at my quilt, I’m reminded of my mom and how she taught me all about strength, courage, and perseverance. I’m reminded that she loved God, and she loved the people that He had placed in her life. Seeing these familiar pieces of old fabric woven together in a new way reminds me that God can take the pieces of our lives and make something new and beautiful out of them. God can take something unexpected and use it to remind us that we are loved by others and by Him. I still miss my mom every day, especially on the holidays, but losing her has helped me realize that time is a gift. Make the most of the moments God gives you. 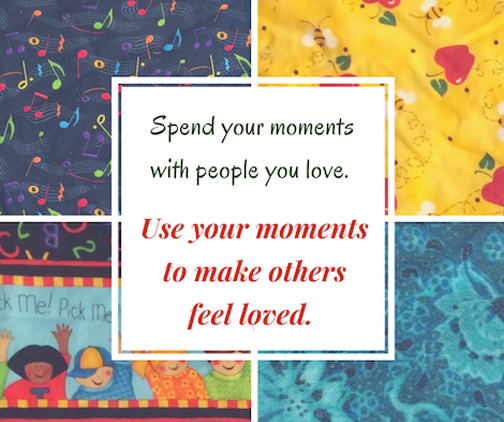 Spend them with people you love, and use your moments to make others feel loved. This Christmas, as we celebrate the birth of Jesus, remember that one of the best gifts you can give someone is the gift of your time. Who will you give it to?